Classic shirting stripes have a simplicity that makes them timeless and universally appealing. 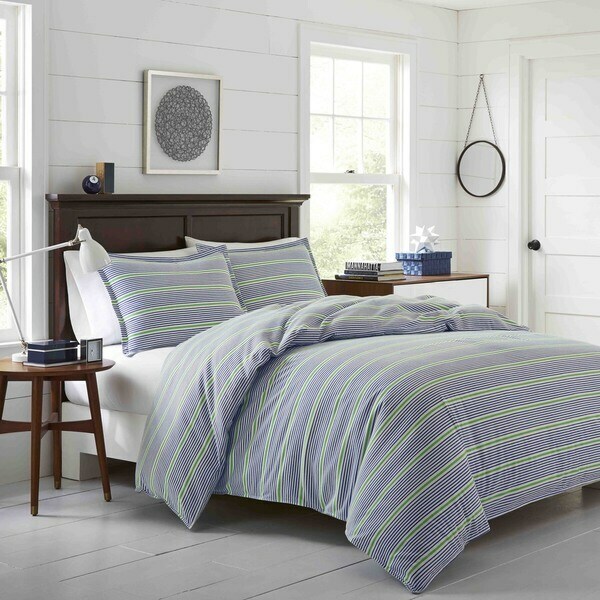 The preppy palette of Navy and Kelly Green on white gives this all cotton flannel bedding collegiate flair and a casual attitude. I chose this duvet cover because it is flannel and my grandson wanted something soft. The fabric is not especially soft. It is navy and white striped with a single wider green stripe every eighth stripe, not the narrower double green pictured. It is much more vivid than it appears in the picture. I was twice sent the wrong size and ultimately dcided to look for something I like better. Overstock was quick to send me return labels and hopefully they will also be quick with the refund.